With consumers leveraging a broader array of online and offline media when searching for local business information — and increasingly relying on smartphones and tablets to conduct searches — local businesses need to expand and refine their advertising approach in order to remain competitive, according to new research released today by the Local Search Association. LSA’s annual “Local Media Tracking Study,” conducted by Burke, Inc., measured the reach of various local media sources among U.S. adults throughout 2012. The results showed strong consumer usage of a variety of online and offline media for finding local business information, including new sources such as Daily Deals and Ratings & Review Sites. The top three media sources that study respondents said they referenced in the past month and over the past year when searching for local business information included: search engines; print and Internet Yellow Pages; and store circulars, email promotions or coupons. Newer local media options like Daily Deals, Internet Social Networks, and Ratings & Reviews Sites show notable, but smaller past-month and past-year reach. As the number of online and offline local media increases, each platform continues to attract a sizable consumer audience. The study suggests local businesses should strive for an integrated, wide-ranging presence across media in order to reach their target consumers wherever they search. Consumers searching top local online media sources for products and services are increasingly doing so from their mobile devices, as opposed to stationary computers/laptops, according to the study. Between 2011 and 2012, there were notable upward shifts in the numbers of respondents who said they accessed Internet Yellow Pages and Internet Search Engines via their mobile phones/smartphones and netbooks/tablets. Ratings/Reviews and Daily Deals sites, which were added to the study for the first time in 2012, also attracted high mobile traffic. Respondents who accessed those platforms demonstrated high affinity for mobile phones/smartphones and netbooks/tablets in helping them reach those sources. While a majority of respondents indicated that computers/laptops are the platform they use first to look up online information – as well as the one they prefer to look up information and making purchases – growing numbers indicated both higher use and preference for mobile phones/smartphones and netbooks/tablets between the first and fourth quarters of 2012. Higher mobile device usage and preference is coming at the expense of laptops/computers. 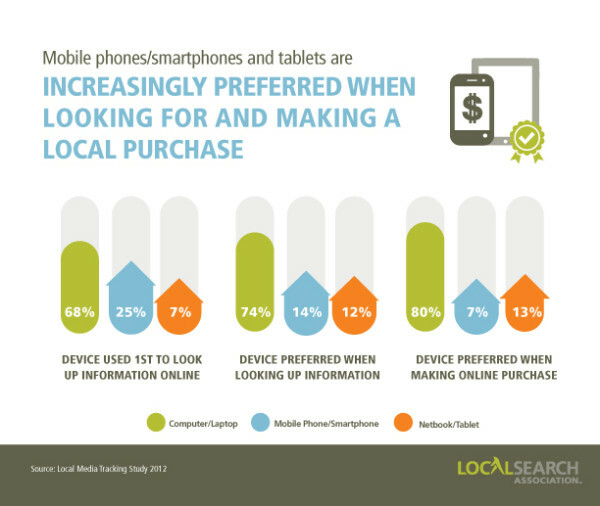 In order to keep up with consumers’ increasing affinity for mobile devices when searching and purchasing products and services, local businesses will need to ensure their online efforts support key mobile components, and introduce smartphone- and tablet-friendly websites in order to remain competitive and attract new customers. Local businesses will also need to adjust their approach to reflect which methods work best to reach consumers in the mobile space. Given the proliferation of mobile apps, one surprising statistic from the study was that both mobile phone/smartphone users and netbook/tablet users generally prefer mobile websites over mobile apps. That said, if the budget allows, local businesses benefit from pursuing strategies that support both mobile apps and the mobile Web, so potential customers have the option to use what works best for them. When considering which local media to further engage, local businesses should consider the full impact of what the media can offer, from increased consumer reach to the high quality of leads. Internet Yellow Pages, which include offerings such as YP.com, DexKnows.com and Superpages.com, have for years maintained considerable reach among consumers and have played an important role in driving quality leads to local businesses. The study found that nearly half of respondents (47%) said they used Internet Yellow Pages in 2012, resulting in approximately 5 billion references. Following a historical trend, the study showed that Internet Yellow Pages generally attract consumers at the key inflection point when they are ready to contact a business and make a purchase. This is an important consideration for local businesses looking for a solution that drives real sales results. The study also found that Internet Yellow Pages boost both offline and online local advertising – reaching consumers that other local media do not. When Internet Yellow Pages are combined with other local media, the monthly reach of that media is extended. When considering the benefits of increased engagement with any local media, local businesses should look at the full package to ensure that they are receiving the highest return on investment possible in reaching their most desired customers. The “Local Media Tracking Study 2012,” conducted by Burke, Inc. on behalf of the Local Search Association, measured the reach of various local media sources among U.S. adults in 2012. The study surveyed 8,009 U.S. adults age 18+ throughout 2012. The survey was conducted using an online panel (80% of respondents) and offline/telephone survey (20% of respondents).